Who is ready to kick off a new school year with some letter learning fun? We've been learning and practicing letters this week. The Sleepy Little Alphabet by Judy Sierra was recommended by Inspired to Read in the #pb10for10 challenge this year. It's bedtime in Alphabet town, but none of the little letters (lowercase) are ready for bed. Move through the alphabet as the big letter parents (capitals) put their tired letters to bed. This book has everything I love about an alphabet book. It has fun alliteration that remincent of Chicka Chicka Boom boom (with less repition). It has fantastic text layout. I hate when the child can never find a clear copy of the letter anywhere in the book. Big pet peeve :) The pictures have extra details which lend themselves to beginning letter sound awareness. For example, b is on a bike wearing a baseball cap. It has humor. It has three year old humor. O and P upset the potty. Logan finds this hysterical. This book goes straight into my best loved alphabet books pile! After reading this book, we created known letters with our purpllinker. What is a purpllinker you ask? Let me show you. It's a plastic hinged tool that can be moved to form letters. 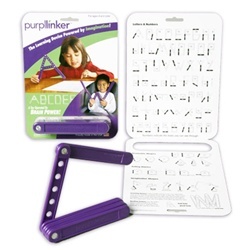 Looking much like great grandpa's old-fashioned carpenter’s ruler, but smaller, softer, safer, and easier to maneuver, the child-friendly Purpllinker, with its seven arms, will hold its shape, allowing your child to create the entire alphabet. By forming letters with the Purpllinker, your child will be building small-muscle memory and fine-motor skills. The purpllinker is small enough to toss into a diaper bag or a travel bag, making on the go learning easy. The purpllinker is multilevel. Bending the ruler in just the correct way actually takes a lot of problem solving. This would be a wonderful tool for a family who has older children and younger children. The older child could use the instruction sheet to form the letters while the younger child named them. The purpllinker is about $12. This is a lot cheaper than the set of letter learning tools we have been using. The purpllinker can be used for more than just letter learning. The instruction sheet includes designs for letters, numbers, geometric shapes, telling stories (building different houses, building cranes, forklifts, giraffes). When you create a letter, the curves aren't truly curved. Since we are using a program that directly teaches the terminology of curves, lines, it's important that we are consistant with that in our letter learning. I think the purpllinker could be better for my son to practice known letters after they are very secure in our other curriculum. A lot of the letters don't look anything like the letter they are supposed to represent. This really confused Logan (age 3) who has a strong letter knowledge but probably isn't able to think of letters that abstractly. I would recommend the purpllinker to children who have a very secure knowledge of letters and who are ready for abstract learning. If your child is easily confused by letter knowledge, this would not be the best tool to use for beginning instruction. This was my first review for the Timberdoodle company and I have to say, I am very impressed with their company. They provide homeschool curriculum for infant through high school. My order arrived very quickly and customer service was great. I also love that you can order items in a curriculum pack (preschool Timberdoodle Core Curriculum 2011), or if you don't have $304 to fork out at the moment, you can order the items individually. For instance, you could start with a purpllinker for $12.49! You can get a free homeschool catalog from Timberdoodle. As a member of Timberdoodle's Blogger Review Team I received a free Purpllinker in exchange for a frank and unbiased review. We're reviewing the Purpllinker next month - my kids LOVE it so far! We loved The Sleepy Little Alphabet - such a great book! They both sound great, but I take your point about the curves. I had kids who couldn't "see" tangram pictures either. What a neat product. I'm wondering if it would make the Cyrillic Alphabet?? ?